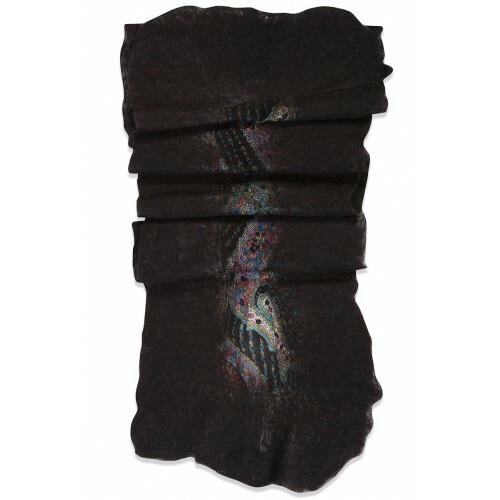 The felt scarf is a mixture of black felt and patterned silk fabric and was produced by Tire Keçecilik. Regarding the production of the felt scarf which we warmly swath in during the winter time, firstly, the lamb’s wool is cleaned, washed and died. The wool is laid on matting, fabric is laid over it and another wool layer is laid. Water is sprinkled over the product, the matting is wrapped and scrubbed. The wrapped matting is opened, all the inconveniences are corrected, boiled soapy water is sprinkled on the material and wrapped and scrubbed once more. The product left to mature for half an hour is again washed with soapy water and is left to dry. 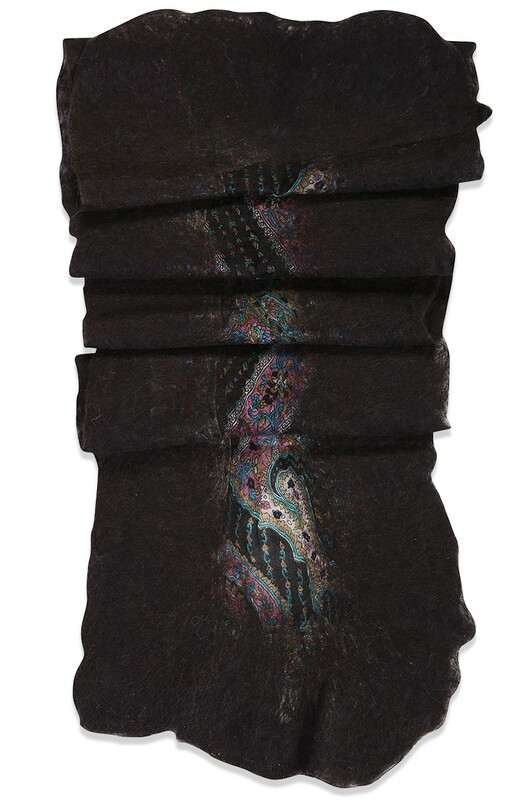 Dimensions: width 25, length 160 cm. Having spent his childhood years in his father’s little accessory store in the lash bazaar in Tire, Mehmet Yılmaz started to produce souvenirs appealing to everyone by founding a small felt workshop in order to survive the art of felting, which has begun to be forgotten in the region. 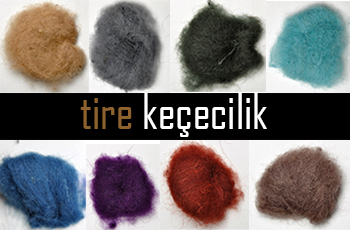 By developing within time, Tire Keçecilik has become a family business; providing employment to house-wives. The company produces wool of 72 different colours from the raw-materials obtained from the ovine breeding companies in the Aegean Region and sustains the art of hand-made felt with modern designs. The company also provides courses.